Ohitashi is one of the popular food for Japanese dishes. 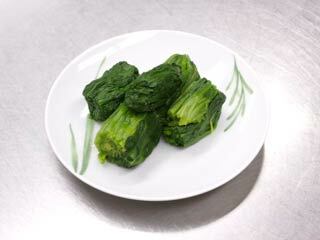 When you boil vegetable such as a spinach and add soy sauce, that is Ohitashi. Unlike salad, you can eat a large amount vegetable at once with Ohitashi. First, wash spinach. Make sure remove all soils especially at the bottom. Next, boil spinach with salt water. dip it from the bottom. Boil it about 1 to 2 minutes. Once its rib gets softer, that's good. Then, clench it to drop water. Let's cut. remove the bottom. If you like it, you can eat it. That's all. Check it out. Spinach get this small after boiling. You can add Natto, post larvae, tuna and any other your favorite. I'm going to add soy sauce. Let's eat. Taste good and healthy. Please try it.